A few months ago I saw some posts on Twitter that featured the covers to a series of Italian young adult novels under the title of “Sherlock, Lupin, & Me,” written ostensibly by Irene Adler (actually, Alesandro Gatti), about adventures she had when she was young with Sherlock Holmes and Arsène Lupin. I thought the covers were delightful, the concept sounded like fun, and I put the English translation of the first book, The Dark Lady, in my Amazon shopping cart. At some point, I reasoned, I’d need another book to bump an order up to qualify for free shipping. That day arrived, and I had a package from Amazon waiting for me when I returned home last night. Sherlock, Lupin, & Me: The Dark Lady, as mentioned, is the first book in the series. In 1870, Irene Adler and her mother leave Paris (where Irene’s father, Leopold, is a railway executive) and summer in a town along France’s Atlantic coast. There she meets William Holmes, aged fourteen and also summering in France (along with his mother, brother Mycroft, and sister Violet), and his best friend, Arsène Lupin, aged thirteen (and the son of a noted circus acrobat). Irene quickly bonds with the two friends and decides that William’s middle name Sherlock is a much better name than fusty old William. The trio spend their days at an abandoned mansion, reading, trying on disguises Lupin has taken from the circus, and having fun. Then a body in fancy dress washes up on shore by the mansion, Sherlock finds a suicide note in his pocket, and Irene spots a mysterious man in a hooded cloak spying on the trio as they examine the body. And shortly thereafter, one of Sherlock’s mother’s bridge partners reports that an expensive necklace of hers was stolen by “the Rooftop Thief,” a local legend, a man who seems to go out at night and execute amazing and impossible robberies. Sherlock, Lupin, and Irene decide that this is a mystery for them to solve while avoiding the scrutiny of the adults around them. Considering that the book wasn’t aimed at me, and I’m thirty-five years past its target audience, I enjoyed The Dark Lady quite a bit. (More, honestly, than Andrew Lane’s Young Sherlock Holmes book series.) Sherlock Holmes isn’t the Great Detective yet, Arsène Lupin isn’t the Gentleman Thief yet, and Irene Adler isn’t the great opera singer yet (she’s embarrassed by her singing voice), but there are definite signs, more than hints, of the people they will grow up to be. They’re clever and brilliant and curious, and they make a very good team. The mystery takes the trio into some difficult circumstances (street ruffians, illicit gambling dens, a critical revelation in Paris), and they find some unexpected allies along the way. The premise of the trio as childhood friends may be very non-traditional, but they have a fun rapport, the pages turn quickly, and I once I finished the book I added the second volume to my Amazon cart because I’d enjoyed this one quite a bit. That said, the book is not without flaws. The translation of the Italian original is very smooth, but occasionally the language doesn’t feel authentic to the 1870s. (I have a difficult time imagining that Sherlock Holmes would ever refer to Arsène Lupin andIrene Adler as “guys,” for instance.) But modern language makes sense given the audience is middle grade readers. The other flaw is that the mystery doesn’t quite work. The solution seemed to come out of left field. 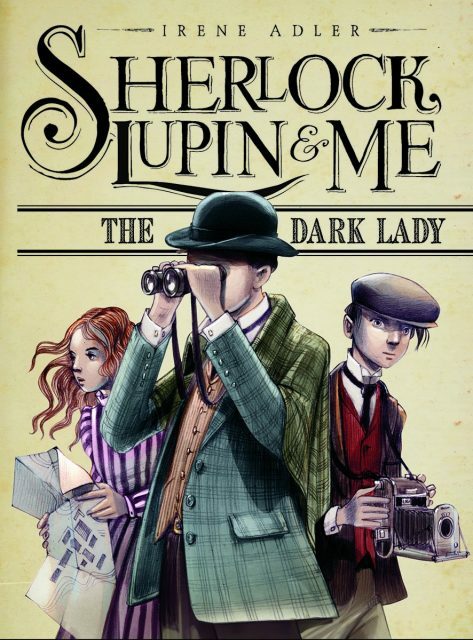 Still, I enjoyed The Dark Lady,I thought it was a great deal of fun, and younger and budding Sherlockians would probably get a kick out of seeing Sherlock Holmes and Irene Adler as childhood friends and their adventures together with Arsène Lupin.